It's 4 p.m. Well, actually, 4:10 p.m. I should be thinking about what to feed my family tonight. Instead, I've spent about 40 minutes playing on Facebook, 10 minutes sorting photos, two minutes thinking that I really should clean the house, and about 30 seconds justifying why I'm not cleaning the house. I mopped our (very) sticky kitchen floor earlier, though. Whew. I'm worn out. Anyway, I decided that while the kiddos are busy playing outside with friends, I would share with you why I'm not stressing about what's for dinner. We have sauce. Lots and lots of sauce. While our overload of tomatoes was one reason for making sauce, the real reason I wanted to stock up is for days like today. Today, I don't have one creative idea of what to feed my family that will not illicit grief from the kids. I thought about risotto, which Peter and I love...but the kids despise. I thought about chicken, but right now, I'm having an anti-chicken phase. (This happens every few weeks, after I've been reading sustainable farming literature. We buy organic chicken, but still...some days, I just can't go there.) So, rather than do our fallback routine of going out, which has become too frequent, too expensive, and too questionable regarding our waistlines...I'm pulling out the sauce. It's healthy. It's delicious. It's homemade from organically raised produce. Even the garlic is from our garden, which personally—I find very cool. Garlic is good. Homegrown garlic is great. So, because I feel your pain as the dinner hour approaches, I'm sharing my super easy, incredibly scrumptious sauce recipe. Get to the Farmer's Market tomorrow morning, 8 a.m. SHARP. Buy tons of tomatoes, if you haven't grown your own. Tell the farmer that you need delicious, organic tomatoes to make a big vat of sauce, and you might get a price cut. Locally, one vendor sold 25 pounds of tomatoes for \$10. Granted, they weren't heirloom, but they were organic. Make sure you select nice, ripe tomatoes. I am not a chef. I am not even a very good cook. My recipe is one that I found on Cooks.com, and then modified to meet our personal likes. Extra garlic. Extra oregano. Extra wine. The beauty of this sauce is that it's fail-proof. It's great on it's own, but it's also fabulous with extra goodies, like mushrooms, sausage, and peppers. I make the basic sauce and then add the extra ingredients later, as we're preparing the meal. Ready? It's time to get to work! One of the biggest hassles in making sauce is peeling the tomatoes. Do you know the secret for easy peeling? If not, I'm going to tell you. You will thank me. Fill a large pot with water and heat on high to boil. Fill another large container with cold water and ice. Make sure it's near the stove. After washing your tomatoes, slice a shallow “X” in the bottom (blossom) end of the fruit. When you've “Xed” the tomatoes, add them to the boiling water for about one minute. 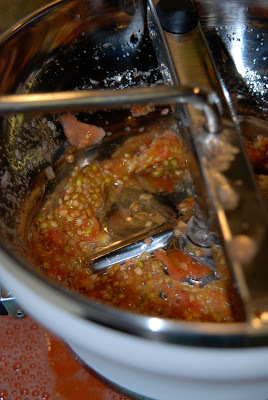 Using a slotted spoon, remove the tomatoes from the pot and plunge them into the bowl of ice water. The ice water stops the tomato from cooking and further loosens the skin. Cut the peeled tomatoes through the center of the fruit—not through the stem end. Squeeze the seeds and juice into a bowl. DO NOT THROW THIS OUT—just set it aside. You won't eliminate all of the seeds, so don't stress about removing every last one. Cut tomatoes. Chop, dice, whatever makes you happy. Remove the stem with your knife. It's hard and nasty—you don't want it in your sauce. Chop the tomatoes. The size isn't too important—the tomatoes are going to cook down, but if you don't like large chunks in your sauce—you'll want smaller pieces. Set aside. The food mill is pretty fabulous. It has legs that support it over a bowl, so while you're pouring seedy juice into it, you don't have to try to balance the food mill at the same time. So—pour in the seeds, juice, pulp...crank the handle of the mill a bit until most of the liquid is in the bowl—and voila! If you don't have a food mill, a fine strainer will work. OK. Still there? The hardest part is DONE! YEA! Wash your hands, get the tomato goo out from under your nails, drink a little wine, and get ready to cook! Onions, garlic, and olive oil, oh my. Chop your onions and mince your garlic. We like a lot of garlic, so modify the amount to your taste. If you have fresh basil and oregano—use it, your hands will smell wonderful! Chop the fresh basil and oregano until fine. If you don't have fresh herbs, dried works fine, too. ...and all remaining ingredients (salt, pepper, sugar, herbs, wine) to the pot. Stir well, cover, and bring to a boil on medium-high heat. Once the sauce begins to boil, remove cover, reduce heat, and simmer for about three hours. Cut or tear some good bread, and dip into the sauce every hour, just to make sure it's to your taste. You can always add more spices to suit your palate. The greatest thing about this sauce is that it freezes beautifully. Wait for it to thoroughly cool, ladle the sauce into freezer-safe containers (size dependent on your needs), pop into the freezer—and you'll have the taste of summer all winter long. And when the witching hour hits, you'll no longer wonder what's for dinner. In a large, heavy pot, heat olive oil on medium high. Add garlic and onions. Saute until soft. Add all remaining ingredients to pot, mixing well. Cover, and cook until boiling over medium-high heat. Reduce heat, remove cover, and simmer for at least three hours. Stir occasionally.